Peanut Butter and Chocolate are a match made in heaven! I’ve compiled a list of must-try peanut butter & chocolate recipes from around the web. Enjoy! Do you have a favourite peanut butter & chocolate recipe? Share the link in the comments below! *sniff* Now if only I could eat chocolate. This. Is. Killing. Me. Chocolate and peanut butter (the combination) used to be like the fifth food group for me. It’s hard to pass up…but I have to. So sad. Great list, though. Chocolate, peanut butter? ummm… hello! Yummy! Wow, thanks for sharing these! I love peanut butter and chocolate. I used chunky pb and it was even better, however I cooled it in the fridge and it was a bit brittle so it broke into neeven pieces when I tried to cut it, so no perfectionists on this one, but it is flaky and tastes just like butterfinger bars, though I think this version doesnt stick to the teeth as badly and that is a plus!!! Love peanut butter anything. Thanks for all the recipes. Why wait til after the holidays to gain weight… Lets start now and enjoy ourselves! Yummy!! 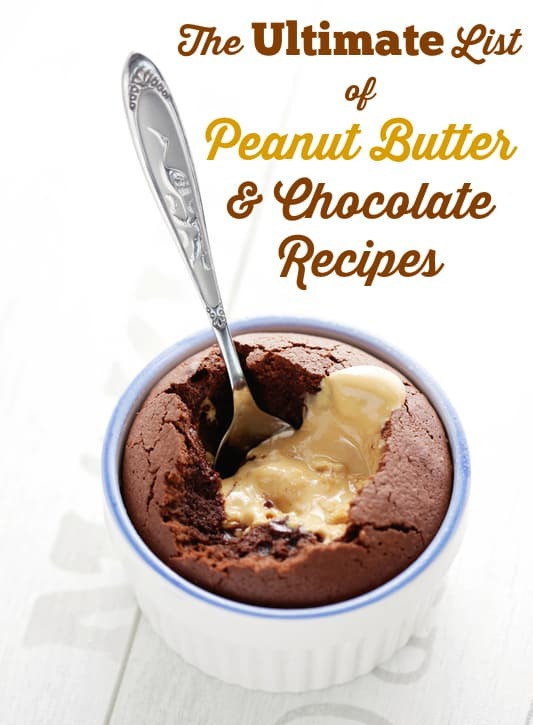 Peanut butter and chocolate is one of my dh’s favorite combos … this list is going to keep me busy in the kitchen for awhile LOL! This actually reminds me of a gift idea … a treat of the month club! I did that a few years back for my fil and he loved it. Made an official, fancy gift certificate and rolled it up like a scroll, attaching it to his first treat. Then each month, by the 25th, I brought him another treat. Best gift ever! Haven’t thought about that in awhile, but this would be perfect for dh with this list of recipes as my guide. Thanks! There is no better combination on Earth. I can’t wait to try some of these great recipes! Wow, what a great list of recipes. Thanks for posting. Read it before and still love the list. Thanks for posting on FB. Nice to come back, drool, and get ideas. Chocolate and PB just go together!! !